After a successful run in early 2017, the Passat Alltrack Wolfsburg was returned to the line-up some time ago, joining the Golf R hatch and wagon variants that pay homage to the brand's home city. The Wolfsburg crest again brings a host of exterior and interior embellishments over the regular Passat Alltrack - for a $3700 premium. This latest Wolfsburg Edition also allows VW to update it with its latest technology, namely its Discover Pro infotainment system and front and rear manoeuvre auto braking. Exterior differentiation to the regular Alltrack comes in the form of 19-inch 'Albertville' alloy wheels, LED headlights and daytime running lights, tinted rear windows, and darkened LED tail-lights. There's a premium look and feel to the interior too - with the Wolfsburg taking the Passat's presentation up another notch with a piano-black centre console, brushed-aluminium trim inserts, and LED ambient lighting. And the black Nappa ribbed-leather upholstery (mixing genuine and artificial leather) looks and feels great, with fine comfort and good support. Wolfsburg adds ingress/egress assistance for the electric front seats. Extra light can be filtered into the cabin by adding a $2000 panoramic roof - the Wolfsburg's only option besides the $700 charge for metallic paint. The Active Info Display virtual instrument cluster gives the Alltrack Wolfsburg an Audi touch, while the Discover Pro touchscreen - complete with page-swiping gesture control - also lends an above-the-mainstream sense to the cabin's sophistication. Volkswagen's famous attention to detail is evident in touches such as the carpeted door and console bins, and rubber lining for the key/coin mini-tray and twin cupholders (with sliding cover). Quality dips in some predictable areas, with hard plastics evident on the centre console and lower doors. More surprising for VW is that cost-cutting is evident on the rear doors that ditch the softer mid-level trim. Only candidates for the World's Tallest Person honour in the Guinness Book of World Records would struggle for room in the rear. There's more than ample space for heads, knees and feet, and the scalloped/ribbed outboard seats are great to sit in - aided by a cushion overlap that enhances under-thigh support. Three adults across the back wouldn't be completely uncomfortable, either, while there are ISOFIX anchor points for young'uns. Rear vents provide the third quadrant of the standard tri-zone climate zone system. The Passat wagon remains VW's cargo king. With a 639L boot that expands to 1769L with the 60/40 split-fold seats (almost) flattened, neither the Tiguan (615L/1655L) nor Touareg (580L/1622L) can match this more traditional wagon that offers a higher ride height to tempt SUV-lovers. There's more than two metres of cargo floor length with rear seats lowered, and just over a metre of width between the wheel arches. The big, squarish boot features a cargo blind, two flip-down hooks, tie-downs, side storage areas, 12V socket, and convenient seatback release levers. The Wolfsburg's auto tailgate gains a 'kick under the bumper to open or close' function. Driver aids shared with an equivalent regular Passat wagon, the 140TDI, include adaptive cruise control, autonomous emergency braking, lane assist, lane departure warning, blind spot monitoring, fatigue alert and rear cross-traffic assist. An auto high-beam system is about the only notable omission. 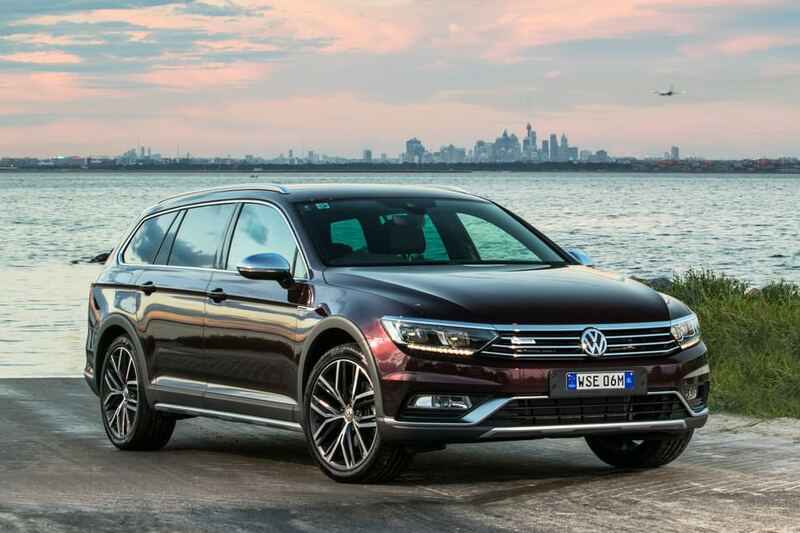 The Alltrack Wolfsburg does gain switchable damping (Adaptive Chassis Control) - the only Passat other than the flagship 206TSI R-Line to feature it as standard. Drivers change the suspension - and steering, engine and gearbox mapping - by selecting Comfort, Normal or Sport on the touchscreen (with a Drive Mode button on the centre console providing a short-cut to the relevant page). There's also an Individual option that allows you to choose different modes for different vehicle parameters. Keeping the drivetrain in Sport with the damping in Normal is a set-up we eventually found preferable around town to achieve the most satisfactory response from the 2.0-litre four-cylinder turbo diesel while maintaining ride comfort. Throttle response is otherwise doughy at low revs in Normal, or plain tardy in Comfort or Eco. The 140TDI engine is otherwise a strong performer with its 400Nm available between 1750 and 3000rpm. It doesn't sound intrusively unpleasant, either, if you rev towards the 4600rpm redline, though meaningful momentum tapers by 4000rpm (where peak power ends). The oiler is generally quiet on the move, and only at idle is the noise not entirely subtle. Official fuel economy of 5.6 litres per 100km is also a good figure for a 4.8m all-wheel-drive vehicle. Comfort is generally worth avoiding on the road, not just for inferior engine response. It makes the suspension too floaty on country roads and freeways, whereas the mid-mode Normal better balances control and comfort. The urban ride in Normal deals particularly well with low-frequency stuff, with larger surface blemishes more noticeable though without any temporary discomfort. Sport doesn't introduce unbearable stiffness, however, and for Tourist Drive-style roads brings a useful tautness to the chassis, sharpens the Alltrack's entry to corners, and enlivens the drivetrain. The steering becomes a touch heavier in Sport and is generally well weighted and enjoyably smooth. The steering-wheel-mounted paddle levers are worth using if you're a particularly keen driver, as the six-speed dual-clutch auto's do-it-itself Sport mode tends to hang onto a gear higher than ideal. That DSG transmission continues to be a double-edged sword: swift shifts on the move, though also a tendency to hesitate at very low speeds. If you don't mind potentially spoiling the Wolfsburg Edition's stylish, 19-inch Y-spoke alloy rims, the Alltrack can live up to its name - to a certain extent. It clears the ground by an extra 25.5mm over the regular Passat wagon - to 174mm - though it's relatively low when you compare it to a key rival such as the Subaru Outback (213mm). Yet, the Haldex all-wheel-drive system, biased towards the front wheels in normal driving, has the smarts to get torque quickly to the rear wheels to maintain traction on slippery surfaces, such as dirt or gravel trails. An Off-road mode - like other modes selected via the touchscreen - brings a descent-control system into play, adjusts the ABS calibration, and retards engine response and delays transmission upshifts.